Don’t wait for the New Year to start your resolutions. Start today with these 5 strength training exercises. Push ups: Great not only for shoulder and chest strength but also for your abdominals, push ups can be modified for any strength level. Start in a toes and hands position. Slowly lower your chest down then back up. Variations: knee push ups, toe push ups, feet on bench push ups. Hand position: at shoulder level, narrow or wide grip. Perform as many repetitions as you can maintaining good form. 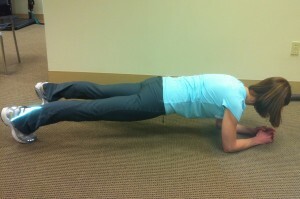 Remember to keep your body in a long straight position throughout the push up. Pull ups: Great exercise for shoulder and upper back strength. Use a pull up bar, or the monkey bars at the playground. Work slowly pull yourself up and down as many times as you can. Variations: If you are unable to do a full pull up start in the up position and hold yourself up as long as possible. You can also use rubber tubing to provide you with an assist to complete the pull up. Hand position: you can use a narrow or wide grip, overhand or underhand. Planks: Front, and side planks are not only good for your stomach, but also for your shoulders, back and hips. 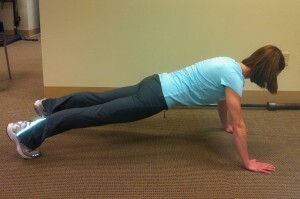 Front plank: support your body on your toes and your elbows. 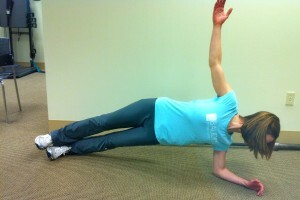 Side plank: support yourself on the side of your foot and your elbow. Make sure to keep your body in a long straight position throughout. Hold your planks for as long as you can while keeping good form. Increase time as able for up to 1-2 minutes. Lunges: Great exercise for gluteal/ leg strength, and core stability. Step forward with one leg. Lower the back knee towards the ground. Return to the up position slowly with good control. Keep your upper body upright during this exercise. Repeat for 10-15 repetitions on each side. Variations: try side lunges and back lunges. As you get stronger you can use hand weights to add resistance. Technique: Your technique is very important, don’t cheat, control your speed and body position. Keep your body tall with all of these exercises to add focus on the core. Make sure to work within your limits and without pain. If painful modify the exercise until pain free. At 20-30 minutes twice a week, these 5 exercises provide great strength options for home. Start strength training today for a strong 2012. Disclaimer: The information provided on Baudry Therapy Center ’s website and blog is presented for information and educational purposes only. This general information is not intended to diagnose or treat any medical condition nor to replace diagnosis or treatment by your healthcare professional. Before beginning light or moderate intensity physical activities, we encourage you to talk with your healthcare provider about health and exercise as part of your everyday routine. Baudry Therapy Center and its respective agents, heirs, assigns, contractors and employee’s will not be held liable for any injury incurred or exacerbated while performing any exercises, stretches, or any other activity related to the content and information available on this website.